In my 2012 tech survey of students at Salisbury University (my former institution)I asked a new question: "What do you think is the one most important technology skill for a college graduate to have?. My survey received over 600 responses. I may come back to this question in future blogs, but since we are in the month of graduations, I thought it would interesting to see how the seniors 2012 answered this question. A couple of interesting observations about seniors first. This is a group that spends a great of time online. How many hours a week to you spend on the internet? I also asked seniors which technology tools the used the most. I did not ask about word processing programs since I was pretty sure that with 99% computer ownership, word processing was pretty universal. So we see that these are students who are on the web a great deal and use productivity tools extensively. So what did they think were most important tech skills college graduate should have? Well, I got 126 student open ended responses. 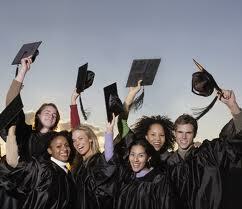 Almost half felt that all graduates should be well versed all of the programs included in the Microsoft Office Suite. Almost half of the responses focus on the suite or parts of it (Word, Excel and PowerPoint). They think that this is the basic tool set of almost any career, regardless of the field. The second most often skill noted was the ability to do critical research on the internet. By critical I think they mean knowing the difference between opinion and scholarly research. They phrase it differently, but they seemed to know that not all web content is equal. The third most often mentioned skill was general computer literacy. Knowing how operating systems work, storing data, dealing with different files and formats seemed to be important. A fair number singled out email use as important. Several respondents also mentioned that knowing how to type is an important asset. There were many others carried opinions touching on knowing how to effectively use social media and using the web for business networking. Two students focused right in on learning to adapt new technologies. A summary review and aggregation of responses suggests that the class of 2012 feels that college graduates need to know the tools of business that(or the world of work) focus on the communication of ideas and communication between people. Many are thinking critically about what is good information and bad information on the web. They also think that they should know something about about how a computer works beyond the basics of a particular program. I know that my sample is small (126) and that the opinions they expressed varied. I think the "take away" for colleges is that we need to acknowledge what students think is important and spend even more time making sure that we provide what they think they need, regardless of the academic discipline. I am not at all suggesting the technology become the center of their education, but noting that they recognize that they are entering a world that requires certain skills and we should too.